Full complex services Project From designing to commissioning. License and Patents Licenses All types of equipment are patented. Tender. Any company can participate in the tender. Waiting for your calls. KALUGIN JSC, a Russian engineering company, was founded in 2000 in Ekaterinburg by Yakov Kalugin, a world-known inventor and Doctor of Engineering Sciences who developed an innovative design of the top combustion hot stove, i.e. Kalugin Shaftless Stove (KSS). 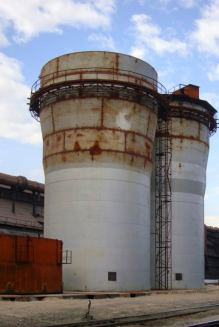 Due to Dr. Kalugin’s invention, KALUGIN JSC came into the market with a competitive product of international standard and quickly gained the lead in development and implementation of Kalugin Shaftless Stoves and different Waste Heat Recovery Systems (WHRS) in blast-furnace production. When developing design engineering documents for Kalugin Shaftless Stoves, the company’s engineers carry out a scientific and technical expertise of the design, fulfil computer modelling, perform all heat engineering and hydraulic calculations. Moreover, high reliability of the stove and WHRS design is provided, among other things, by supply of high-quality equipment and refractory. At all stages of construction KALUGIN’s engineers render supervision services, control quality of erection and commissioning works, provide training for the customer’s operators how to operate new equipment, fulfil commissioning of hot stoves and waste heat recovery systems. So, since the company’s foundation KALUGIN’s engineers have already constructed over 210 Kalugin Shaftless Stoves, among which 30 stoves are in operation at iron and steel works in Russia, 125 – in China, 27 – in India, 9 – in Ukraine, 5 – in Japan, 3 – in Kazakhstan, 3 – in Indonesia, 3 – in Turkey, 3 – in Brazil, 1 – in Czech. Over 40 stoves are now being designed and constructed for Russian and foreign customers. It can be said that over 30% of Russian iron and 9% of world iron are produced using Kalugin Shaftless Stoves. 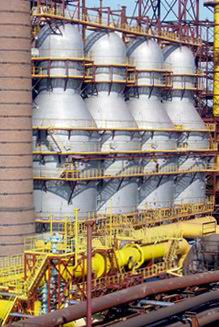 High demand for KALUGIN’s technologies from global giants of metallurgical production is determined by the fact that Kalugin Shaftless Stoves (KSS) have unique technical and environmental features as well as the world’s highest energy efficiency and reliability. At present only these stoves can provide the hot blast temperature of 1350°C, which is 100-150°С higher than the blast temperature provided by other stove designs. This high blast temperature enables to reduce coke consumption and increase performance of blast furnace operation. The unique technology of Kalugin Shaftless Stoves has been patented in Russia, China, Ukraine and is being patented in other countries all over the world. While constructing hot blast stoves, the company’s engineers implement a Waste Heat Recovery System (WHRS) of different types. At some hot stove systems they provide for possible preheating of fuel gas in the waste heat recovery system and preheating of combustion air in minor hot stoves. At present the most popular WHRS design is a model based on thermosyphon heat-exchangers. Over 40 WHRS of this design have already been implemented at iron and steel works in Russia, China, India, Ukraine. Eight WHRS based on tube recuperators have been constructed for customers in India and Ukraine. 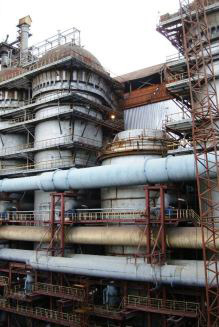 Five WHRS based on plate recuperators have been implemented at Russian iron and steel works. All WHRS designs developed by the company’s engineers are of general purpose and have a very short pay-back period. They can be used efficiently in iron and steel industry, heat and power supply industry, machine-building industry, construction material industry, chemical and petrochemical industry – everywhere where there are low-grade waste gases with the average temperature up to 900°C. Apart from the immediate economic effect of WHRS implementation, its application significantly reduces heat impact on the environment. KALUGIN JSC continuously improves stove and WHRS technologies, enhances technical, economic and environmental performance, provides warranty and service maintenance of its products.